Patricia Nelson Limerick, Charles Rankin, and Clyde A. Milner II, eds. This is the new story of the Old West, told by ten historians who dare to reenvision the American West and knock the field of Western history on its ear. Some historians call it a revolution. 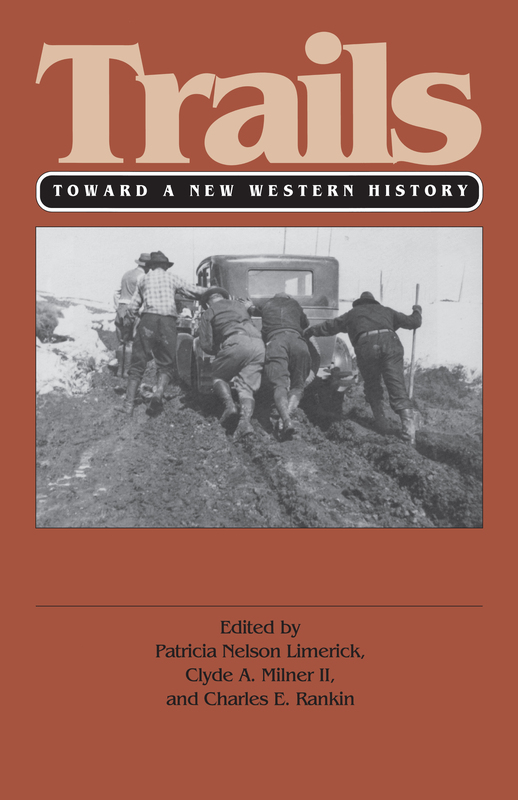 The Trails Conference in Santa Fe, a 1989 gathering organized by “new” western historian Patricia Nelson Limerick, spawned widespread media coverage and academic debate and provided the impetus for this volume. There, at the end of the Santa Fe Trail, leading scholars came together to discuss, debate, and evaluate an exciting new view of our past. It amounts to a far-reaching reexamination of the role of the West in U.S. history and of the field of Western history itself. Trails brings together the best of this new work. The contributors provide a range of views that clarify the changes in Western history. They consider what the “New Western History” is, what its impact on Western history has been thus far, and where it might lead as we move into the 1990s and beyond. These historians reject both the “tall in the saddle” myth and the concept of the frontier and its settlement described by Frederick Jackson Turner in 1893: a single, triumphant process that began with the arrival of white settlers and ended a century later when all the land was claimed. Instead, they see continuity. To them, the West is a region, washed by waves of successive emigrants over a period of 25,000 years; a place with climate, resources, and sustained damage of human habitation. Patricia Nelson Limerick is professor of history at the University of Colorado at Boulder and author of The Legacy of Conquest: The Unbroken Past of the American West. Clyde A. Milner II is professor of history emeritus at Arkansas State University. Charles E. Rankin is acquisitions editor at the University of Oklahoma Press.